Treat dry, chapped skin to the Jurlique Rose Love Balm; an ultra-nourishing formula that works to moisturise, soften and protect. 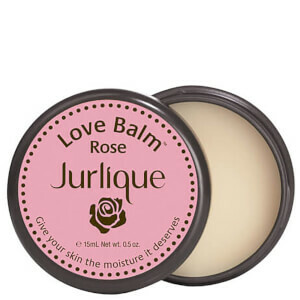 Ideal for the lips, cuticles, elbows or dry areas on the body, the non-greasy balm delivers antioxidant protection and hydration, whilst infusing skin with a luxurious fragrance of natural Rose. Expect smooth, comfortable and restored skin. Olea Europaea (Olive) Fruit Oil, Cera Alba (Beeswax), Cetearyl Alcohol, Carthamus Tinctorius (Safflower) Seed Oil, Caprylic/Capric Triglyceride, Fragrance (Parfum)*, Glycine Soja (Soybean) Oil, Calendula Officinalis Flower Extract, Chamomilla Recutita (Matricaria) Flower Extract, Althaea Officinalis Root Extract, Rosa Gallica Flower Extract, Bellis Perennis (Daisy) Flower Extract, Viola Odorata Extract, Viola Tricolor Extract, Echinacea Purpurea Extract, Bisabolol, Tocopherol, Phenoxyethanol, Ethylhexylglycerin, Totarol, Dehydroacetic Acid, Citral*, Eugenol*, Geraniol*, Linalool*, Citronellol*.